In celebration of National Student-Athlete Day, Muhlenbergs Student-Athlete Advisory Committee (SAAC) recently displayed posters, which highlighted the campus activities of Mule teams and their members, in the Life Sports Center. After winning the Centennial Conference championship last weekend, the Muhlenberg softball team swept the CCs weekly awards. Junior second base Amanda Ibey (left) was named player of the week. 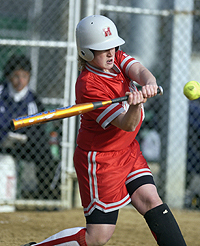 She hit .400 with two home runs and six RBI in four tournament games, and her two-run homer in the sixth inning capped the scoring in the Mules 8-4 victory in the championship game. Freshman Kristina Cartolano (right) was named pitcher of the week. Pitching for the first time in almost a month, Cartolano won both of her starts in the CC playoffs, including one in the championship game. She allowed four earned runs in 16 innings and also hit .400 with two RBI.